It seems like just yesterday, or I guess a month, that Buzz Aldrin was in town (here). This time around, there's a contest going on to win a chance to ask him a question - courtesy of the Museum of Science. As July 20, 2009 marks the 40th anniversary of Neil Armstrong’s first steps onto the moon, Americans everywhere can use this special day to educate younger generations about exploration, space, and American history and recollect their own memories of this pivotal moment in time. 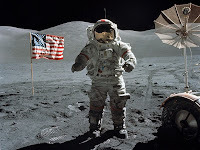 The Museum of Science, Boston is offering an unusual opportunity: if you’ve ever wanted to ask Apollo 11 astronaut Edwin “Buzz” Aldrin about what it was like to join Neil Armstrong as the first humans to walk on the Moon, now’s your chance! People of all ages are invited to email their questions to askbuzz@mos.org by July 16th at NOON, and if their question is chosen, they will win the opportunity to call in their question to Buzz Aldrin live from the Museum of Science. There will be a live NASA broadcast from the Newseum in Washington, D.C. from 2:00 – 3:00 featuring a panel discussion including Apollo astronauts Buzz Aldrin, Alan L. Bean, Charles M. Duke, Jr., space shuttle astronaut John Grunsfeld, and the deputy director of NASA’s Goddard Space Flight Center, Laurie Leshin. The lucky winner of the “Ask Buzz” contest will ask Buzz his/her question first! That gives you a week to mull it over. I'm thinking right now as I type, and I can't really think of anything that I'd like to ask. Probably something about how he feels about the current state of space exploration and his thoughts on private companies like SpaceX and Virgin Galactic. 0 Response to "Contest: Ask Buzz Aldrin a Question"